Nel cuore della vita Nizza! Nel cuore di Nizza, sulla famosa Avenue Jean Medecin! La spiaggia si trova a circa dieci minuti a piedi potrete raggiungere passato Nice Etoile, Place Massena e la Promenade. Lo studio è completamente rinnovato e modernamente attrezzate. La posizione Avenue Jean Medecin ON è ottimale per godersi la città sia in vacanza o viaggio di lavoro! Si può fare a meno della macchina durante il vostro soggiorno, con tutti i punti di interesse a piedi 10 minuti, la spiaggia, tutti i tipi di commercio, centro commerciale Nice Etoile, la città vecchia, il Massena e la Promenade di inglese. Il trasporto pubblico è anche facile da usare con il tram di fronte all'edificio e la stazione ferroviaria 5 minuti a piedi vi permetterà di visitare facilmente la zona da Cannes a Monaco. Fare colazione sulla terrazza soleggiata di fronte alla bellissima Cattedrale di Notre Dame. La vista panoramica dal 5 ° piano sulla Avenue Jean Medecin è chiaro, con di fronte a una zona pedonale. Entirèrement ristrutturato con doccia italiana e lavatrice. This adorable studio was perfect for the two of us. 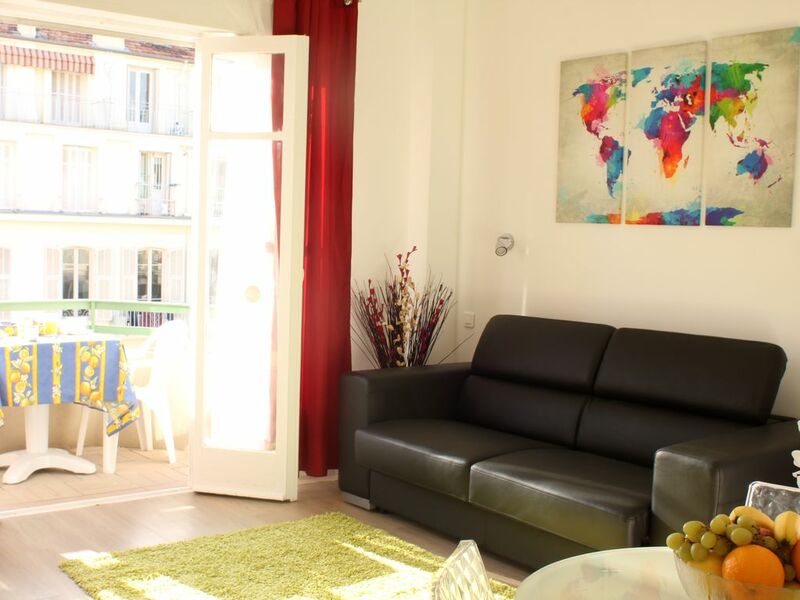 The location was ideal for enjoying the balcony overlooking the city life as well as very close proximity to the main train station and the local tram. There is a supermarket (Monoprix) located just a block down the street that has almost anything you would need for a nice meal on the balcony. Bright and open space with very high ceilings. The couch shown in pictures doubles as the fold out bed which was decently comfortable for a fold-out. There is a crank-down shade that covers the entire balcony door and windows that provides a very nice dark space for sleeping and dampens some of the street noise below. We had no issues sleeping but light sleepers or those not accustomed to city noises may want to look elsewhere. The bathroom was reasonably appointed. There was a new washing machine installed but the directions are only in french and I was unable to find an english version anywhere online so the machine was a bit of a challenge. The bathroom wasn't the cleanest, there appears to be spilled paint in part of the shower that was not cleaned up. The shower door only covers about 1/3 of the opening so the bath mat will likely get soaked. None of these items were overly significant for us but worth noting. The kitchen had lots of necessary tools but lacked any knife sharper than a butter knife. We picked one up during our travels and left it with the place. Unlike many vacation rentals, this property does not come with any informational booklet on how to operate the appliances, who to contact if there is a problem, local resources, etc. Not the end of the world but would have helped with the washing machine. Overall, the place was in a great location and was a perfect fit for us and the price. The property owner was very quick to respond to inquiries during the booking process. We would absolutely rent this property again if we find ourselves back in Nice.